Earn while you spend with our 600 Loyalty Points Scheme. Every £1 you spend on our site* will earn you additional discounts on your next purchase. Bonus points will automatically accrue each time you sign into our site and make a purchase. 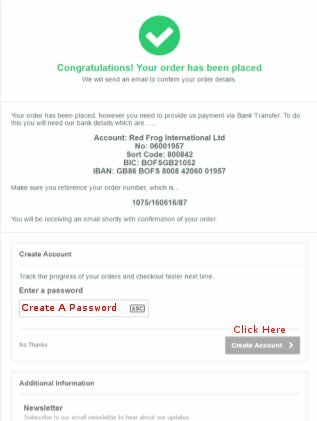 To create an account just sign up on the last page of checkout, as illustrated below after payment has been completed. It does not matter which payment type you select. Each time you shop with your accrued points will be displayed and you will be offered the option to spend them or roll them over.